She says: Well after a little over two months in SE Asia we have started making our way West. Singapore was actually a destination we had considered visiting while we were in Malaysia. We had heard it was a really nice city but pretty expensive so had decided to skip it. Deciding which countries to hit and which to miss is always tough. However, thanks to Jet Star completely ripping us off ,and after numerous calls and hours on the phone with them, they finally decided to give us some flight vouchers. We had already bought all of our SE Asia flights by the time we received the vouchers so we had to decide whether we were going to add an additional location in order to use them… or not. OF COURSE we were 🙂 So we picked Singapore. 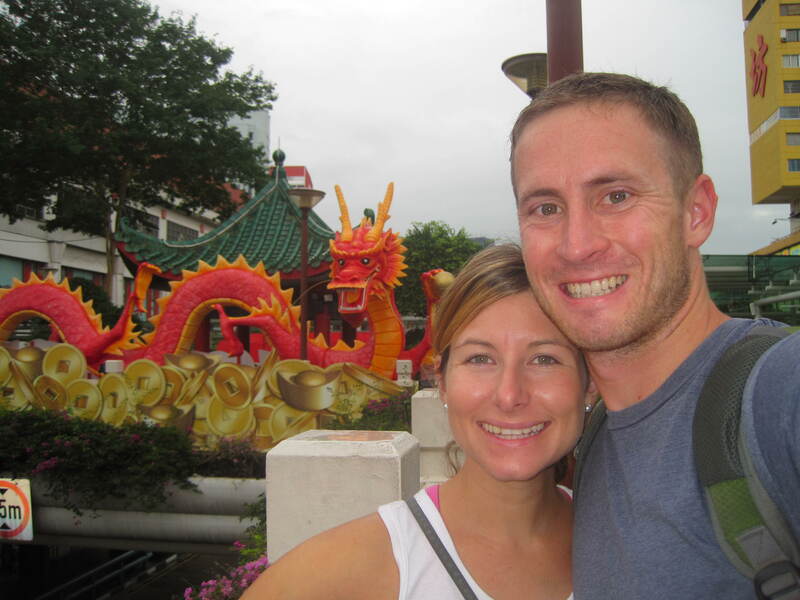 Although we really loved our time in SE Asia, arriving to Singapore was like a breath of fresh air. We had not seen a mall or a KFC in a looong time. I say KFC because surprisingly enough, they outnumber Starbucks and Mc Donalds everywhere we have visited. I do not have official numbers but I am pretty sure I am right on this one. Anyways, coming back to civilization is always nice. We had five days to spend in metropolis so we got started right away. J had to go to the embassy to get more pages added to his passport so that is the first thing we did. On our way to Singapore we kept talking on the plane how great it would be if there was a Chili’s in Singapore. Chili’s was our treat to ourselves on the road trip. I had made a rule on the road trip that we weren’t allowed to eat at any chain restaurants; Chili’s was the one exception 🙂 We would get the exact same thing every time we went– hot wings, the chicken quesadilla explosion salad, and a beer. Well lo and behold, just blocks from the American Embassy was a Chili’s!! We thought we had died and gone to heaven. It was very serendipitous. You should have seen J’s and I’s faces. We just both looked at each other with eyes wide, jaws dropped, and I am pretty sure we had some drool coming out of our mouths. We really couldn’t believe our luck. I told J it was karma and we must have been really good people lately..haha. Whatever the reason or pure coincidence — we accepted it and ordered our usual. Ahhh civilization, we have missed you!! As far as sights go, there wasn’t too much to see other than the city itself. There was what looked like a big ship that sat on top of a few skyscrapers. We asked a waiter what it was and he said it was a casino. We learned our lesson in Las Vegas, no thank you 😉 We went and saw a movie instead– “Girl With the Dragon Tatoo”. It was a GREAT movie. I highly recommend it– even if you didn’t read the book. 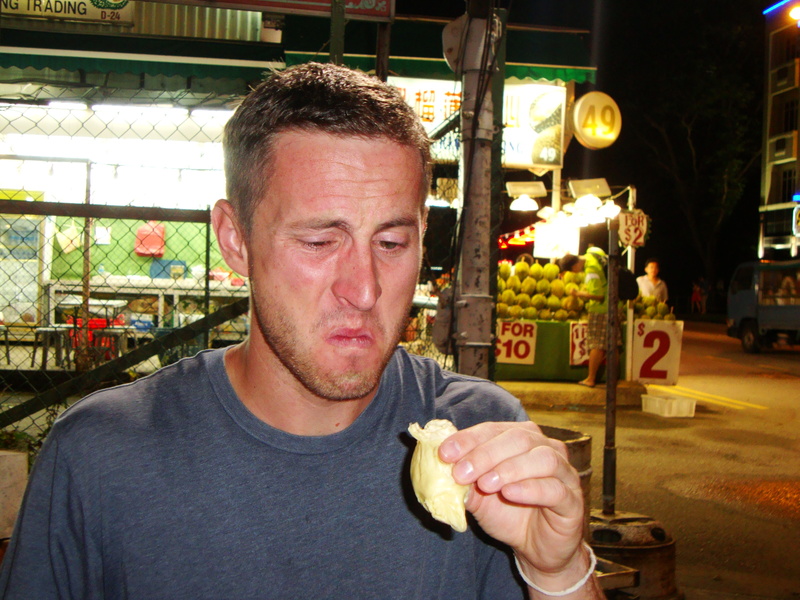 For us, the highlight of Singapore was tasting the Durian. All around the streets of SE Asia J and I kept smelling rotten fruit or trash or possibly a combination of them both. We had no idea where it was coming from. We just thought that they had poor trash pick up so things laid around for days which produced the awful stench that we would often smell. 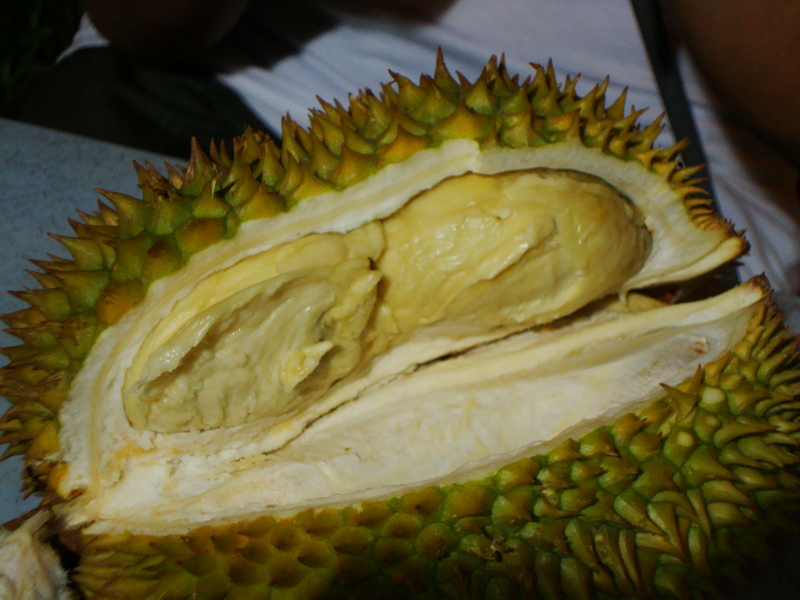 When I had called my wife she said that her friend grew up in Singapore and recommended that we try her favorite fruit, Durian. 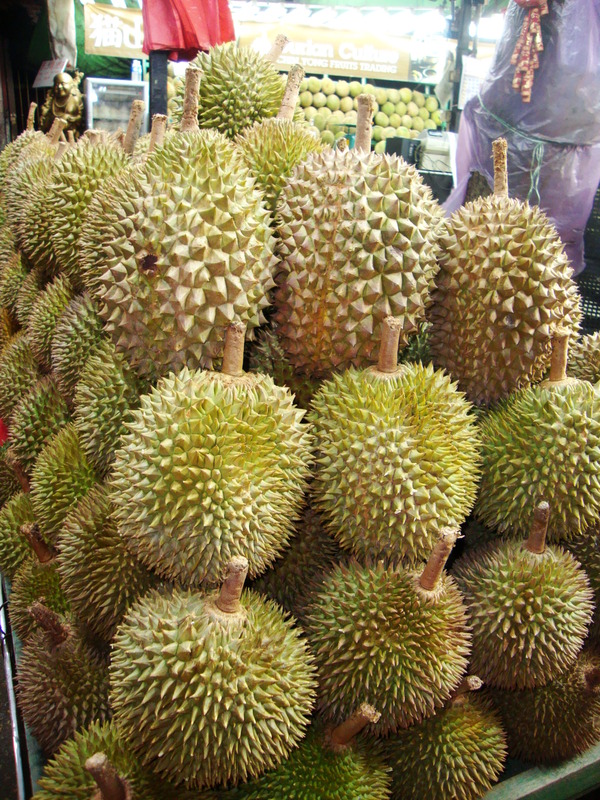 I googled Durian to ensure we ordered the right fruit at the market. While reading about it, I found that the fruit actually has a rancid smell that offends many people. So much so that many hotels have outlawed occupants from eating it inside of the hotel. Since Durian is a very popular fruit among locals in SE Asia, I knew this is what J and I had been smelling the entire time. We had no idea. Amanda wanted me to try it and report back to her. She ensured me it wouldn’t be that bad and said her friend told her it kind of tasted like custard. I obliged and told her we would try it later that evening and report back. I was excited the entire day about trying it. I thought if I can just get over the smell it might actually be really good. We finally made it to the market and ordered some. The market worker cut it open for us because it is pretty much a porcopine. We took it to a little table outside of the market where people sit and eat these things. Yes, it is that popular that they have set up eating areas for them. Anyways, I went first. The smell was as bad as I expected. But the taste…the taste was worse!! The texture was somewhat like custard but did not taste like custard at all. I do not even know what to relate it to. Maybe J can better describe the taste. It was the worst thing I have ever tasted in my life, EVER! I had to spit it out. If the instantaneous reaction to throw up in my mouth a little wasn’t enough, I had to brush my teeth about 7 times just to get the taste out of my mouth. I think I may have even washed my mouth out with soap which sadly, was better than the Durain, J gave it a few chances but eventually gave up. We ended up giving the rest to a guy sitting at another table who already had 5 of these disgusting things. He was very excited about our gift and just gave us a little smile letting us know that indeed Durian is an acquired taste. Chinatown. 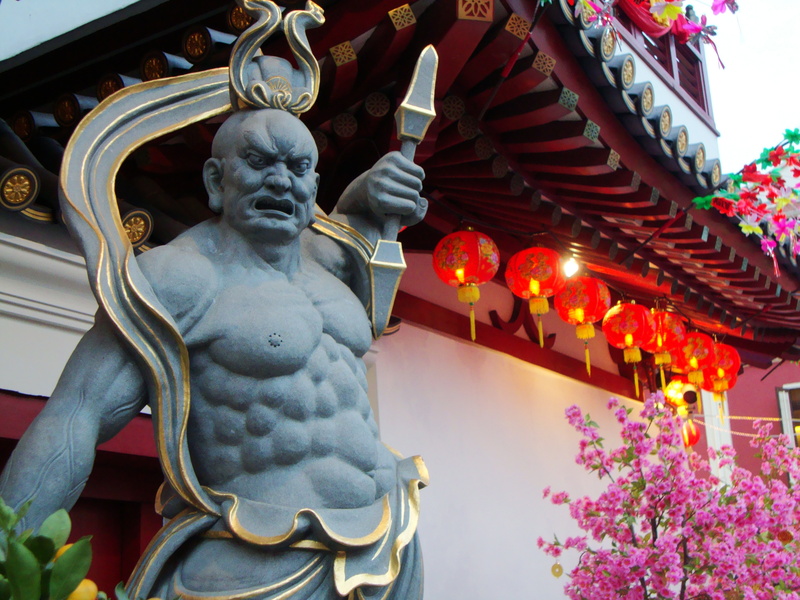 2012 is the year of the Dragon! Enjoying a glass of wine o the Quay! 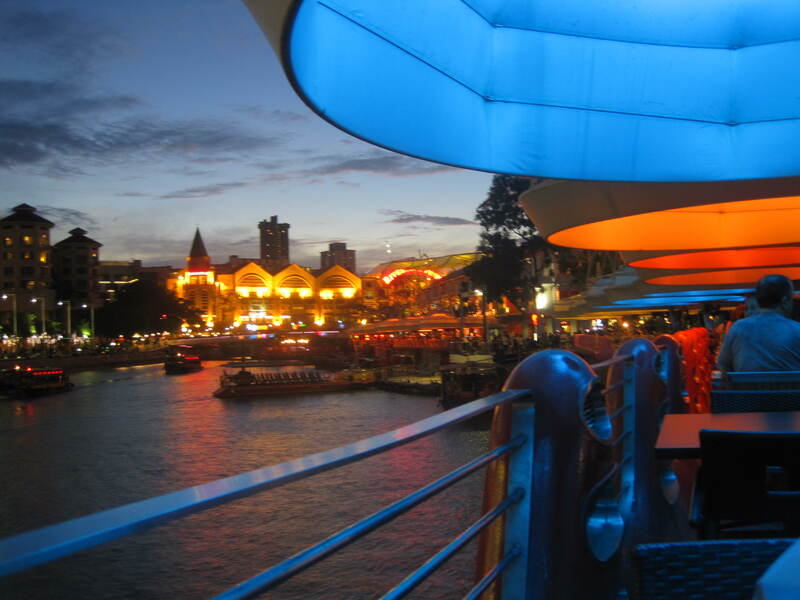 Like TB said, the durian was our most memorable part of Singapore. We had a great time walking though Chinatown, Little India and Clark Quay but I don’t think anything will ever compare to the experience of durian. The smell was obviously offensive and the fact that it was ubiquitous didn’t help. You would think with so many people eating it there would be an upside to swallowing something so unpalatable…maybe a sense of euphoria or hallucinations. Nope. No dice. TB let it touch her tongue and that was enough. I ate a few bites trying to give it chance, thinking maybe it gets better as you go. Negative. Being a lover of custard I was looking forward to it but this tasted more like custard left to ferment, mixed with year-old garbage disposal leftovers and topped with a dash of stomach acid. Suffice it to say we didn’t like it, but at least we gave it the ‘ol college try. The spines should be enough to tell you you're not supposed to eat it. If the spines weren’t enough then maybe the fact that the the inside looks like a chicken embryo will dissuade you. 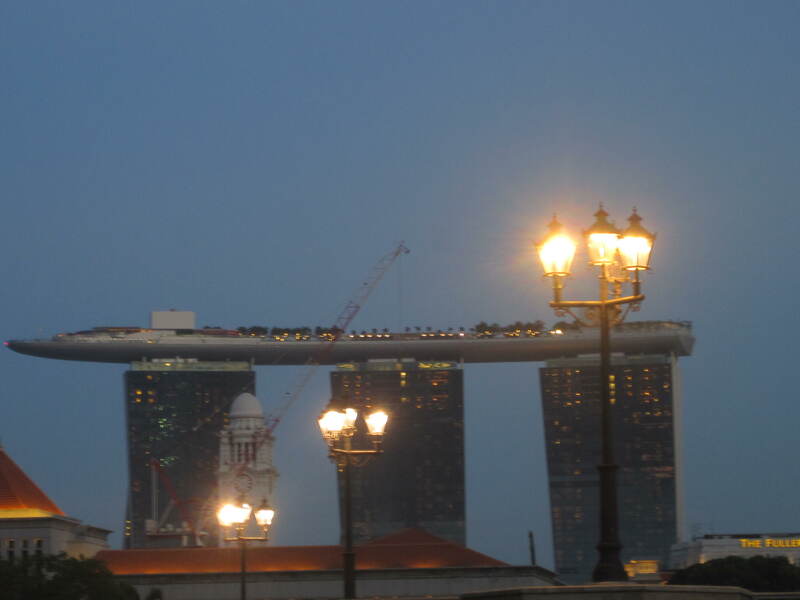 Singapore was a great way to rest between SE Asia and India. We savored the hot water, steady electricity, wifi and chain restaurants we’re used to. 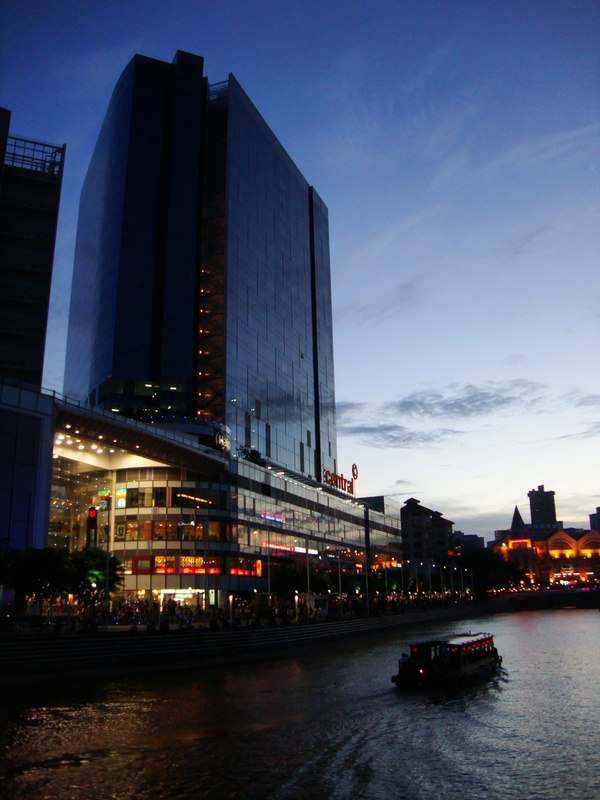 ← Vietnam – Frogger, hard feelings and…Happy New Year!